Algae are an essential part of a healthy Lakes system. Algae produce oxygen and are an important food and habitat source for fish, water birds and invertebrates. A diverse group of plants, algae are mostly microscopic. In low numbers they are not highly visible and are an important part of the food web. We generally see algae as ‘algal blooms’, which are made up of millions of alga. A bloom may suddenly appear as a thick, smelly, green, paint-like scum on the surface of a river, lake or dam. Blooms appear quickly as algae are capable of dividing and doubling in number every 2 or 3 days. 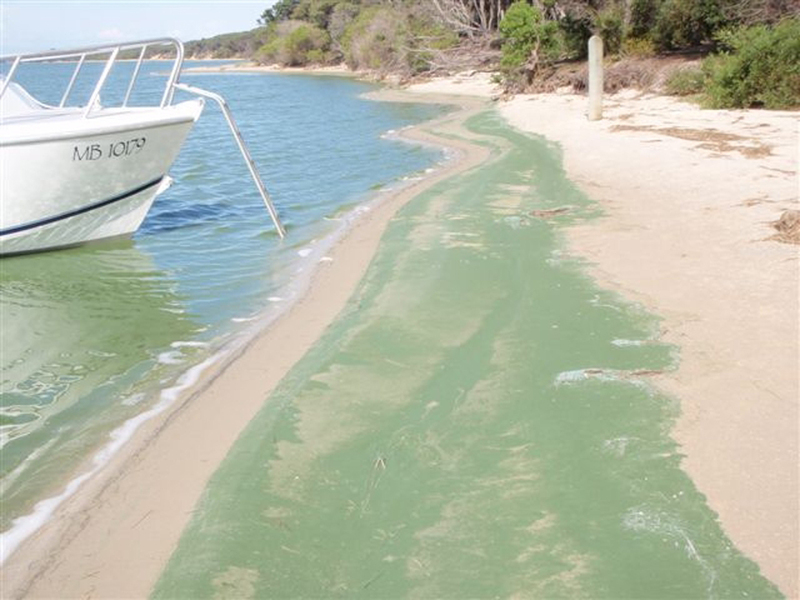 Algal blooms can cause problems. They can look unattractive, smell horrible and make the water taste unpleasant. Also some species produce toxins which, following contact, can cause skin irritation, diarrhoea and vomiting as well as other more serious side effects. When an algal bloom dies, the decaying algal cells use up the available oxygen in the water causing oxygen depletion, which can result in fish kills. Some of the main factors that contribute to algal growth are abundant nutrients, warm weather and relatively still, calm conditions. Limiting the nutrients entering our waterways and Lakes may assist in controlling algal growth. Protecting and revegetating our lake foreshore and riverbanks is one way to help minimise algal blooms.